Right there in the middle of my Chico’s catalog, I found this little insert. And if it hadn’t been for the dog bone, I may have skipped it entirely. But I’m a sucker for anything dog-related, so I read the fine print, as it were. Here’s the deal: Chico’s wants to know why you love your dog. Yeah, it’s that easy. You write about how smitten you are with Spot, how taken you are with Tippy, how enamored you are with um, Enid. 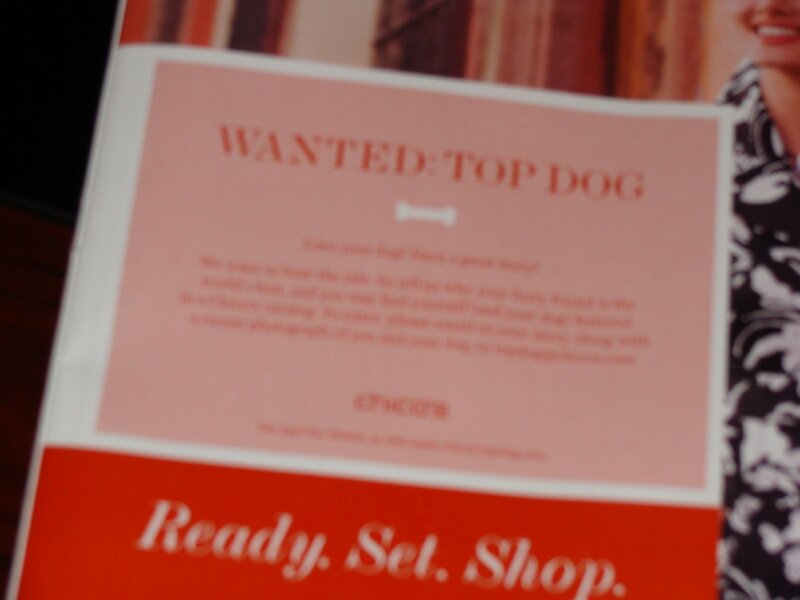 Then, take a picture of yourself with your furry friend and email the whole entry to topdog at chicos dot com. But don’t fiddle around too long, ’cause you only have till March 16th, 2009. Oh, and you can get all the fine and furry details here. And if I were you, I’d think about wearing something chic from Chico’s in the entry picture. In fact, I think I’ll get Sally the crazy dog to wear something from Chico’s, too. Sally looks fab in scarves (when she’s not ripping them to shreds). ← WOW!Children’s Writing at WOW! That’s it. We cats have had enough! Dogs get all the good stuff. Love your dog? What about your cat? You think we’re just window dressing? Cats rule the world and if you don’t know that, we’ll claw up your furniture. Dear Fluffy,I think you just answered your own question.